Prior to this feature, we looked at some early AFC Storylines to Watch , as the Draft and OTAs are not far away at this point. Now we zero in on the NFC from a fantasy perspective. Incoming rookies will alter some of these situations, but here is what we should be keeping tabs on as the offseason moves into the preseason with an ultimate eye on the first week of the 2019 schedule. Arizona Cardinals: How much can Kyler Murray boost a sagging passing game in the short term? Can he make Christian Kirk and Ricky Seals-Jones more viable fantasy options? I will be betting that Murray to Kirk will become an immediate connection, with the second-year WR vaulting into consistent fantasy starter territory. Atlanta Falcons: Is Ito Smith ready for his close up? I believe the Falcons drafted Smith last year with an eye on Tevin Coleman leaving as he did this offseason. If Davonta Freeman cannot stay healthy, the second-year RB could be in for a heavier workload at some point. Carolina Panthers: The obvious story to follow will be the health of Cam Newton. Another topic to monitor will be the possible passing of the torch at tight end. Greg Olsen still wants to play, but does his body agree? Ian Thomas could step forward and start moving ahead of Olsen as a receiving priority. He showed real flashes of promise last summer and late in the 2018 season. 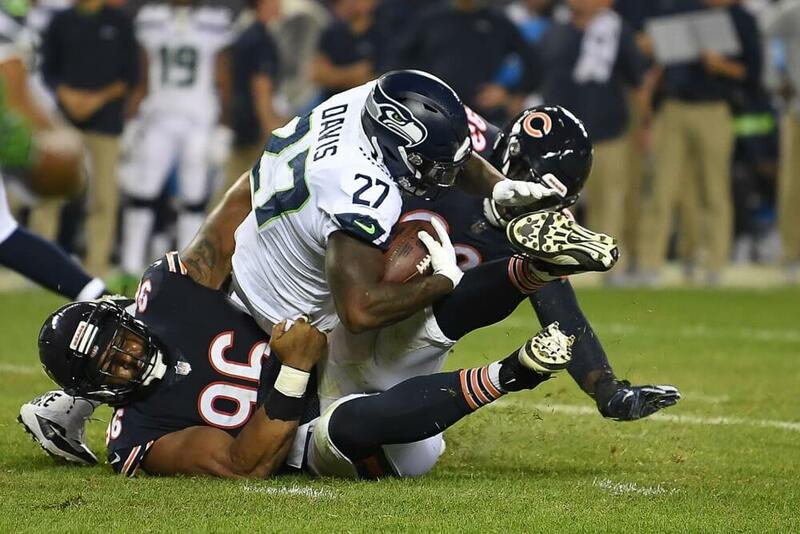 Chicago Bears: Many fantasy analysts, including some notable ones right here at FanTrax, have already openly disagreed with me that the Bears found their new featured runner when they signed Mike Davis. I believe he deserved an opportunity to start somewhere and now he has found it. He stepped forward every time he was needed in Seattle and displayed the type of abilities that gained notice. He was an authoritative runner who made people miss at the second level and he showed he can be trusted near the goal line, too. Davis will have a strong preseason and will be the ideal complement to Tarik Cohen. He’ll be on the lower end RB2/high end flex line. Those who are expecting the Bears to draft another RB early simply don’t respect Davis because he has never gotten this type of chance before, and with all due respect to some other fantasy analysts, are looking behind at Davis’ past roles and not ahead to what he could be. Don’t be afraid to step away from past narratives on a player who may be ascending. Dallas Cowboys: I will be looking for Michael Gallup to take even more strides forward and wrap up the starting job opposite Amari Cooper. Randall Cobb already looks like a has-been and is just veteran insurance at the position. But Cobb will be good for depth as the third WR in Dallas. Detroit Lions: When the Lions signed C.J. Anderson, all of a sudden I saw social media speculation about how he may become a “goal-line vulture” who can hurt Kerryon Johnson’s value. Wait, when did Anderson become LeGarrette Blount, as one person suggested? He rushed for two TDs in two regular season games with the Rams, and he had a two-TD game against Dallas to open the playoffs, but he did not score in the final two postseason games, and in the previous three seasons, he never rushed for more than five scores. He certainly is capable of rushing for a TD or two when he starts, but that won’t be the case with the Lions. Johnson ran for scores in his final two regular season games last year and there’s no reason to believe he won’t get a large number of opportunities near the goal line. Anderson may get opportunities here and there as many teams give occasional TD chances to a backup, but I see no reason that Johnson won’t be the main short yardage TD option while playing an expanded role in 2019. Green Bay Packers: Throughout the Aaron Rodgers era, the Packers have always been a pass-first team. Now it seems like Green Bay has no choice but to give Aaron Jones the ball often. The receiving depth is still shaky, and it’s smart to ease some pressure on Rodgers with a respectable ground attack. Los Angeles Rams: The decision not to re-sign C.J. Anderson or acquire a notable backup may be a sign that the Rams are not overly concerned about the condition of Todd Gurley’s knee. Let’s see what stories develop in the preseason, but he may not see much action to keep him ready for when play counts. A strong preseason for John Kelly could make him the clear primary handcuff to Gurley. Minnesota Vikings: The Vikings need Dalvin Cook to stay healthy for the team to have optimum offensive balance. If he cannot make it through another season, we could see Ameer Abdullah get a chance to revive his career. The way it stands now, he is the primary backup to Cook. New Orleans Saints: There is much speculation that New Orleans could draft a WR early. They have already done well to nab Jared Cook as a free agent. He is coming off a career year with Oakland and should be a frequent target for Drew Brees inside the 10-yard line. Cook will play a large role on important downs and should sustain his momentum from 2018. New York Giants: The only storyline to watch here is what happens at QB on Draft Day. We are seeing all kinds of conflicting reports on what position and who the Giants will take. But acquiring a safe target like Golden Tate is a sign that New York wanted a trustworthy outlet for a young passer. Philadelphia Eagles: DeSean Jackson was never reliable, and his better days are behind him. I would rather look for a rebound season from Nelson Agholor. The Eagles decided to keep him and give him another chance, and it’s a big risk they took. If Jackson and Agholor both cannot be counted on, there will be some trouble in the Philly passing game. Seattle Seahawks: Pete Carroll told me late last year that he and his staff were very high on David Moore and we had not seen the best of him yet. With Doug Baldwin’s outlook unclear, the Seahawks may need Moore to contribute much more frequently and consistently in 2019. He could be a late-round fantasy value option this season. San Francisco 49ers: Tevin Coleman proved he was not capable of being a featured RB last year, and Jerick McKinnon was never really cut out for such a role, either. Matt Breida is tenacious, but already looks injury prone. Is this going to be a full-blown committee? I say one guy gets pushed out of the mix and maybe even gets moved at some point. Tampa Bay Buccaneers: Ronald Jones may be getting another chance to start fresh under Bruce Arians. Tampa Bay did not make a move to acquire another RB of significance. If Jones is unleashed during the preseason and plays well, he could see his fantasy appeal rise in a big way for 2019. Washington Redskins: There is no one who jumps off the page at WR on the depth chart right now, and Washington may also draft one early. Someone else, though, has to develop a respectable rapport with Case Keenum or a rookie QB. Watch exhibition play and camp reports to see who is making strides between Josh Doctson, Paul Richardson and Trey Quinn. We’ve already seen some offseason buzz on Quinn that may boost his appeal as a later selection in earlier Best Ball drafts.